The Ancient Greeks had a saying; they said that if, after your death, just one person remembered your name, then you had not really died. We perpetuate this saying, perhaps without actually knowing of it, when we read out aloud the names of those commemorated on local war memorials up and down the country on Remembrance Sunday. We call these names to mind and then, in the words of the oft used inscription, Their Name Liveth for Evermore. But not everyone is remembered in this way. This is the story of one man, Harry Woods, killed in 1915, who almost disappeared without trace. And even though he has a grave in Flanders, he seems forgotten in his own country. He is one of many. In 1989, looking in a remaindered bookshop, I bought a copy of 'A Sergeant Majors War - Hill 60 to the Somme'. The book is an edited version of the diaries of Sergeant Major Ernest Shephard of the Dorsets. Starting on the day he sailed for France in January 1915, Ernest kept his diary in small notebooks, sending each book to his sister's husband as it became full. At the time of Ernest's death in January, 1917, there were eighteen notebooks, kept in a chocolate box at the bottom of his sister's wardrobe until they were found and published nearly seventy years later. Stories told to me in my childhood by my uncle, gave Hill 60 a sort of monumental status in my mind. The name itself seemed somehow technological and modern to me, even though the stories were nearly fifty years old when I was their eager recipient. So I began to read my new book with some anticipation. Hill 60 is not really a hill at all, in the natural sense of the word. When the railway came to Ypres in the 1860s, a short railway cutting was made to ease the gradient on the line to Comines. The spoil from these excavations was dumped into two mounds, one on either side of the cutting at its highest point. Neither of them had proper names, although the larger of the two, 230 metres long by 190 metres wide, was given the local name Cote des Amants - Lovers Knoll - in honour of the clandestine nocturnal activities which took place there. In its later notoriety as Hill 60, it was to become the scene of undreamed of nocturnal horrors. The summit stood 60 metres above sea-level and it was marked on the British maps as HILL - 60. And this became its name to the soldiers of 1914-18. In that flat countryside it offered an eminence which was invaluable as an observation point. The Germans, from the top, could see right into Ypres and view the major part of the Salient. For the British, the most important feature of possession of the hill was probably the denial of this open view to their enemies. The Dorsets were in trenches at Hill 60 during the most frightful fighting of 1915, that period of early gas attacks, fearsome to-and-fro fighting for possession of the hill's lowly summit, the frantic rushing into the line to help stave off counter attacks, the early mining operations - Ernest Shephard described them all in his diaries. He was an enthusiastic soldier, a pre-war regular who took a professional interest in what went on around him. As a primary historical source, his diaries are important documents giving a vivid picture of the often trivial aspects of daily life in this place at this time - they illuminate on a personal level the more distant and academic view of the later historian. The Dorsets had their dug-outs a little way along the blasted, disused railway track towards Ypres, at the end of the cutting, in a small plantation of larch trees. There was also a dressing station with its little burial ground. The railway track itself had long been shelled into oblivion. A narrow communication trench zig-zagged where the track had once run, towards the hill. Hill 60 was never quiet in 1915. The horrors of the April and May fighting, when possession of the hill passed from one side to the other, have been well documented. Even when the Germans secured their position on the crest at the beginning of May and set about fortifying the hill (fortifications which would not be broken until June, 1917) it was always a place of danger and sudden death. The British, in their positions around the foot of the hill, would find that for no apparent reason a severe bombardment would start, last for a few minutes or a few hours and then stop as suddenly and as pointlessly as it had begun. But there were always casualties and it was during one of these sudden bombardments that Pte. Woods was killed. "Cool day, wind strongly against us and favourable for the enemy to use gas. Fairly quiet until 2 p.m. when we had a bad time. The enemy commenced a systematic bombardment of the trenches the Battalion was holding. Every kind of shell was used, generally they would send over a heavy howitzer shell and follow that up almost immediately by 3 whiz bang shells, following these up with rifle grenades and bombs. They also used the thing every man hates above all - the trench mortar. This did frightful damage... poor C Company had a frightful gruelling. The whole of 38 trench and a large portion of 39 was blown in and they had over 60 casualties, a large proportion of which were killed. The bombardment continued very intensely until 6 p.m. when it slacked a little, but continued all night." "The big shell which was used yesterday was a trench howitzer shell, very heavy and powerful it was. We found two machine gunners belonging to our company who had been blown from the trench over the railway into a deep pool of water collected there, a distance of 70 yards. One man, Pte. Woods, was found in eight pieces, while others were ghastly sights, stomachs blown open, some headless, limbs off, etc. Up to the present we have found 17 and buried them." It was not the horrific manner of his death which made me take an interest in Pte. Woods; it was the compassion shown by his fellow sufferers. Pte. Woods had, to all intents and purposes, disappeared. His body had already been reduced to fragments and it would have been easy for his colleagues to have simply left it at that. Yet, in spite of all the misery, hopelessness and squalor which surrounded them, they took it upon themselves to give their seventeen comrades what they would have called a decent burial. For me, this episode embodied the spirit of what we now call Remembrance. How many more such burials took place in quiet moments following such horrid personal experiences which would have reduced many of us today to pitiful wrecks. Does each grave in Flanders have such a personal story? Too late, now, to know, but the accidental discovery of the story behind this grave made me want to explore further. I wrote to the Commonwealth War Graves Commission and their reply was both exciting and disappointing. Firstly, there was the news that Pte. Woods of the 1st Btn. the Dorsets had been killed on July 5th, 1915. Secondly, there was an initial and a regimental number. Pte. Woods was now 3/7283 Pte. H. Woods and the little cemetery near the dressing-station among the larches had survived the war as Larch Wood (Railway Cutting) British Cemetery. The CWGC records, at least as quoted in their letter, seemed to have no personal details about Pte. Woods. I knew that often, the cemetery records for individual soldiers gave quite detailed information - names of wives or parents, very brief biographical details sometimes, and even home addresses. There were no such details in the case of Pte. Woods. I asked why. The reason, I was told, is that when the cemeteries and memorials to the Missing were being properly laid-out, after the war, the Commission wrote to the next-of-kin of all those commemorated, to ask for brief personal details for inclusion in the registers. However, with such large numbers involved, it should perhaps come as no surprise to learn that many requests for information went unanswered. Some men had no relatives to answer for them and some letters were never delivered, as people do move away. However, I learned that Pte. 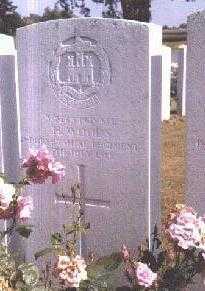 Woods' grave had not been obliterated by the later fighting in the Hill 60 area and it seemed only right to visit it. There were two other threads of research going on at the same time. First of all, I visited Birmingham Central Library to look at the Dorset Regiment volume of Soldiers Died in the Great War and learned that Private Woods' H stood for Harry. He was born in Shrivenham, which was then in Berkshire, and had enlisted at Dorchester. At the time of his enlistment he had been living in Shaftesbury, Dorset. I had also written to Bruce Rossor, the editor of Sgt.-Major Shephard's diaries, to see if there were any sections of the diary, not used in the published version, which gave any more details about Pte. Woods. In his reply, Bruce offered me the use of his typescript version of the diaries and included photocopies of the relevant sections, together with photocopies of the pages of the diaries which contained Ernest Shephard's sketch-map of the Hill 60 trenches, drawn at about the time of Harry's death. From this it was easy to locate trench 39, where Harry and his comrades had been when the bombardment fell upon them. It ran along the Ypres side of the present road past Hill 60, from the railway bridge to the site of the present cafe and museum. On 11th November, 1990, leaning against a fence-post, I looked for a long time at the place where trench 39 had been. The trees around Hill 60 were literally glittering in their autumnal colours, on a brilliantly sunny day. It was a fitting climax to my pilgrimage. Even the weather, I thought, reflected the spirit of Remembrance, having provided the most vivid and memorable of light conditions on this most sombre of days. This was the spot from where, earlier in 1915, Sgt.-Major Shephard and his men, perhaps with Harry Woods among them, looked back towards Ypres and saw huge German shells literally lifting the houses and throwing them down anyhow. As I took in the same view, Ypres looked serene and untroubled in the sunshine. Hill 60 itself seemed peaceful, without a hint of malevolence, not at all an evil place. Trench 39's position, just off the road beyond the fence, seemed so insignificant - just a field of stubble, each stalk sharply delineated in the curious light. And yet this hill and these fields were, as a matter of historical fact, the scene of terrible savagery. Behind me as I stood was the crater of 1917, formed when the northernmost of the Messines mines erupted, taking with it the German garrison on the crest of the hill and changing its shape for ever. To either side of me, in 1915, attacking British troops swarmed towards the hill, engaging the German defenders and making the place where I stood the scene of hundreds of private, savage, hand-to-hand battles. And in front of me - Trench 39, where Harry Woods and the others crouched under the bombardment a few weeks later, enduring each shellburst, until their final one came. There was plenty to think about. Larch Wood (Railway Cutting) Cemetery stands somewhat disrespectfully close to the Ypres-Comines Railway. It seems almost possible to touch the trains as they pass. In 1915 necessity was all-important. The wounded needed to be got to safety and as quickly as possible, so the dressing-station was as closely situated as possible. And as for the dying and the already-dead why carry bodies any further than necessary? There was no railway any more in 1915, when the cutting contained a communication trench, and the dressing-station and its cemetery were situated so as to give the carrying-parties the shortest journey. The cemetery was off a busy trench-thoroughfare then. Now it stands incongruously in the middle of a cabbage-field which is bisected by the railway, rarely visited, to judge by the comments written in the Visitors Book. In Plot 2, stands Row J, which contains seventeen graves. These are the graves of the seventeen men which Sgt.-Major Shephard and his party buried on July 6th, 1915. In Grave 16 lies Pte. Woods. Hill 60 itself seems very close. In later weeks, more replies to letters arrived. I now had a copy of Harry's Army Death Certificate. These documents give fewer details than the civilian version and the only new piece of information was Harry's age at the time of his death - 22 years, indicating a year-of-birth of either 1892 or 1893. I returned to Soldiers Died in the Great War which gives, for each soldier, a name, number, place of birth, place of enlistment and place of residence if different from the birthplace. It also gives a place of death but only in the most vague terms - F&F means France and Flanders. I assumed that the details listed must have come, in the first instance, from the soldiers themselves, probably taken down at the time of enlistment, so I decided to follow up two lines of enquiry - Harry's birth in Shrivenham and his later residence in Shaftesbury. For the years in question, there were four births registered giving the name Harry (or Henry) Woods, but none was anywhere near Shrivenham. I wrote to every telephone subscriber in the area with the surname and received replies from every one, but no-one was aware of a relative called Harry, although everyone sent best wishes and many sent offers of help. The local vicar got his car out one afternoon and toured all the local villages looking for Harry's name on the war memorials, but without success. I also wrote to the local newspapers, churches and schools, receiving in return more good wishes, lots of genuine interest but no hard facts. I was surprised at the number of people who were willing to write to a complete stranger and tell him that they had no information to give him despite having made, in many cases, considerable efforts to unearth some! Enquiries in Shaftesbury, where Harry was living at the time of his enlistment, took an interesting turn. In the Register of Absent Voters (absent, that is, due to active service abroad) was the name Harry Woods, serving in the Dorset Regiment. Incredibly, this was an entirely different man who survived the war, returned to his wife in St. James's Street and lived until the 1930s. This other Harry Woods caused much interest, as when I wrote to telephone subscribers, local papers, schools and churches in the Shaftesbury area, my letters obviously aroused considerable interest and those who decided to engage in a little research on my behalf invariably located him. I was sent a copy of an Order of Service from one of the Shaftesbury churches, asking for prayers for those men of the parish who were away at the war and among the names was that of Harry Woods but it was soon established that this was the other Harry, who lived near to the church and was a regular member before and after the war right up to his death. He is buried in the churchyard. The fact is, that I have been unable to locate any evidence, documentary or anecdotal, to prove that Harry was born or lived where he (presumably) said. He seems to have had no next-of-kin, he is not mentioned on any war memorial anywhere in the UK apart from the Dorset Regiment Roll of Honour at the Regimental Museum in Dorchester and he seemed to be remembered by no-one. Perhaps Sgt.-Major Shephard named Harry in his diary only because of the unusually gory condition of Harry's body when it was found. He might just as easily have not mentioned a name. After all, the two machine-gunners whose bodies were found seventy yards away on the other side of the railway were remarked upon but not named. I deeply regret not having been able to find out more about Harry, especially since the important details of precisely how he died and was buried were presented to me on a plate so to speak. Normally, its easy to find out details of the home life of a soldier of the Great War, but very difficult to get accurate information about his military service, as anyone who has ever tried to research the army career of a relative will testify. This time, it was the other way around. I began by saying that Harry was almost one of those lost without trace - almost. I may have been the first of his countrymen to deliberately seek out and visit his grave, but I am not the last. Some of my correspondents have also made the trip and sent me photographs to prove it. I came into contact with many people during my research and in most cases the contact was fleeting, polite, helpful if possible. But I have also made some real friends both at home and in Belgium and my life (and, I hope, theirs) is the richer for this. All in all, I think I owe a great deal to this almost forgotten young man who died so many years before I was born. World War 1 Document Archive Pictorial Biographical Dictionary of the Major personages of the Great War.